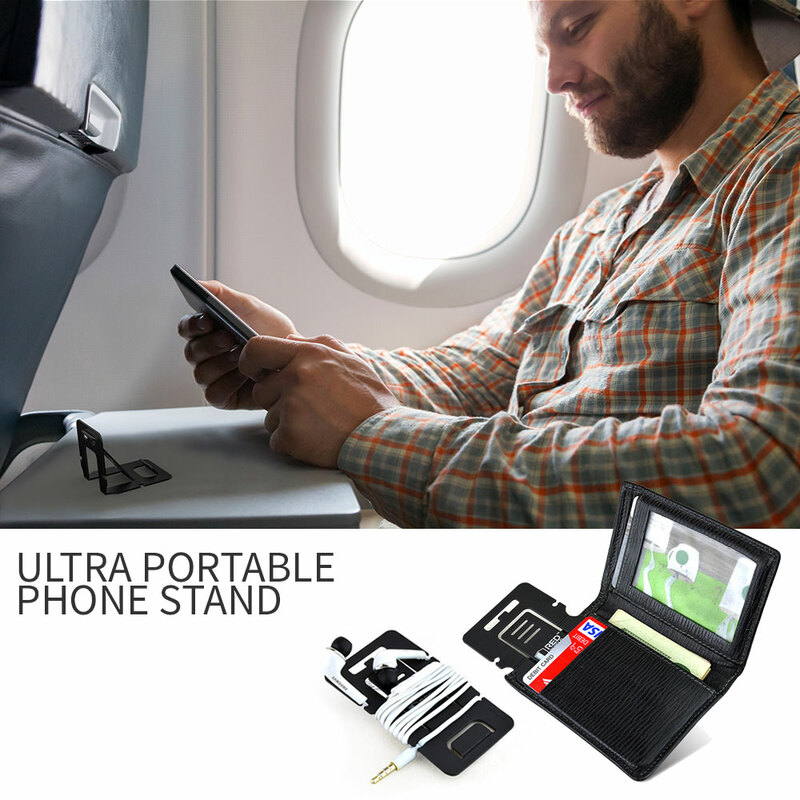 AccessoryGeeks.com | Black REDShield Universale Foldable Phone Stand w/ Cord Wrap (Fits in Wallet!) | Free Shipping! *Hands-on product reviews with our geeky knowledge and techie expertise without all of the technical jargons and cheeky bashing* This RedShield Universal Phone Stand is just so convenient to have around! It literally takes up no space and saves you the hassle of needing to hold onto your phone to watch a video or view photos. 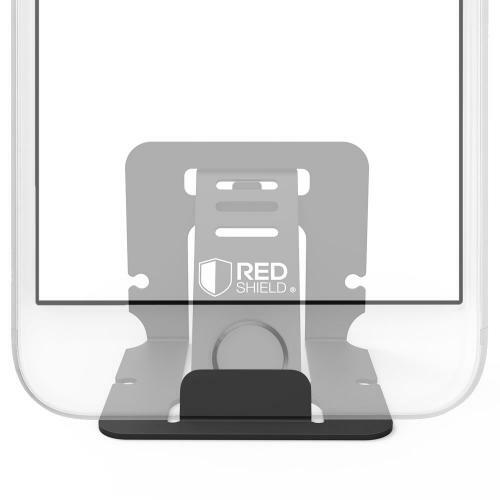 This RedShield Universal Phone Stand is just so convenient to have around! It literally takes up no space and saves you the hassle of needing to hold onto your phone to watch a video or view photos. I am a person who spends a majority of my time on my phone wherever I go. With this phone stand, I can free my hands from my phone and enjoy a burger with both hands while I watch videos on YouTube. It is even small and compact enough to fit in your wallet or purse and being just a few bucks, it doesn't make sense to not carry one of these credit card-looking phone stand! If you are looking for a phone stand that is very lightweight, durable, and can fit in your wallet slot, then you have come to the right place! 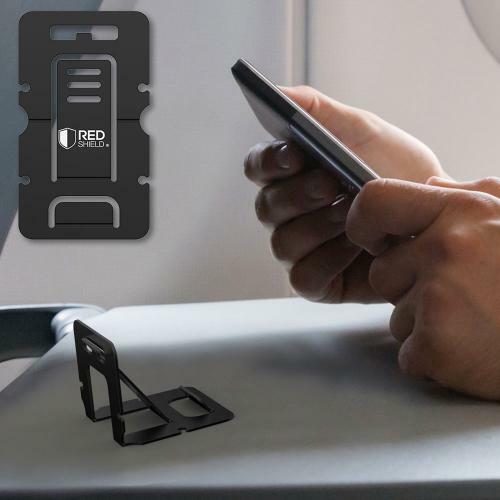 The [REDShield] Universal Phone Stand is lighter and thinner than a credit card, so you can simply place it inside your wallet slot and bring it anywhere. Whenever you need to prop your smartphone up with a stand, this nifty phone stand will always have your back! It comes with 3 viewing angles so you can lock in the angle in place and use your phone from the perfect viewing point. 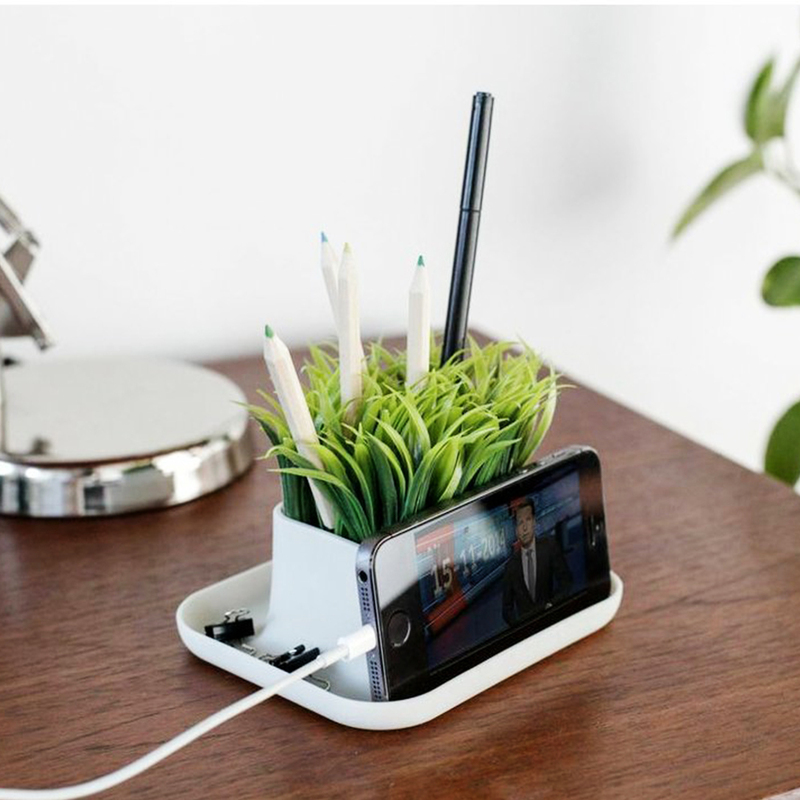 This multipurpose phone stand even doubles as a cord wrap! Great little phone stand! My wife has made calling her sisters to catch up a weekend routine. This is sturdy and perfectly fits fits the bill for her calls, allowing her to carry on conversation. Simple and convenient! Pretty cool phone stand! It is very compact and easy to use we both like the way it hold the my phone and the angle is right, well it is adjustable, and collapsible. Awesome! A simple and elegant cell phone holder. It provides good protection and angle the view that is comfortable to use when sitting in virtually any location I've used it in our home and perfect for travel! Worth buying! I comfortable wathing movies I want anywhere! This is small i can put it inside my pocket, wallet and even in my wallet case plus it is really good ear buds organizer sometimes. Great value! Small, simple and it works great! I purchased this stand to hold my phone safe and secure. It works on a sofa or bed, adjustable, and great for hands-free viewing. Exactly what I needed. Adorable phone stand! I bought this for my office and am planning to get another one for my home. The quality is even higher than I expected for the price. This is my travel companion. I am extremely happy with this product! It fits and hold my phone and table pefectly. Well-made and can be used right side up or upside down. It's worth every penny! Simple, light, and can be stowed or hidden easily. I got these for two of my family members and myself. It holds and keep my phone safe and secured. Folds up nice to put in my backpack or purse when travelling. Perfect for travel or on the go, basically you can bring it with you everywhere since it's so tiny and light. It folds up nice to put in your backpack or purse. Good quality and very useful. Absolutely a great simple phone stand. Holds a modern slim phone and a bulky older tablet just fine. Keep it from sliding around the desk. Great travel companion! Simple and convenient. My husband and I use them quite frequently. It seems sturdy, durable and works perfectly! It hold at any angle and great buddy travel companiion. Small enough to fit into my pocket or a briefcase. Works well for my iPhone and sits on my desk at work or table. Great viewing angle to be choose and great price too! This has been an excellent addition to my travel gear! Fits easy into a pocket in my laptop courier bag along with my earbuds. Highly recommend a great little stand! Love this phone stand! Handy, small, and compact. Very convenient to carry anywhere! Can adjust the exact angle and accomodate both landscape and portrait position. Pretty awesome! Great stand! It holds my phone with case on it just fine. Very secure and stable. Perfect for watching video while on the desk and this is my buddy companion in every travel. Good product. I really like it! Small, cute, functional, very light and easy to carry in my purse. This is exactly what I was looking for in order to prop up my phone in a vertical or horizontal. Exactly what is was looking for. This does a great job of holding my phone while I stream videos to get me through the monotomy of the work day. Great travel companion! Absolutely a great simple phone stand! Holds my gadget from sliding out of place and great angle that makes viewing position at work so much easier. Well worth buying! Love these! My husband and I use them quite frequently. His for videos and mine for reading on my kindle apps. It seems sturdy and like they'll last a long time. Our perfect travel companion. Perfect for video chatting, eliminating the stress placed on my hands from constantly switching back and forth during the long chat session and providing a hands-free environment. Thanks! Bought these for my husband because he falls asleep watching on his phone at night. Small enough and fit into a pocket or a briefcase. We can adjust the view as you needed. Lovely! Love how compact this stand is. Sturdy enough to hold my iPad. Easy to open/close and lightweight. It keeps the device and stand from slipping around. Definitely will buy another one if needed. Great for use in the office and one at home! I like that I can adjust the stand in different levels for more better viewing. Good quality and great price! Sturdy and holds my phone in the vertical & horizontal position. It folds easily and very convenient to have multiple so they can be in different parts of the house. Fit was great! Super handy. Holds my gadgets safe and secure. Compact, adjustable for various viewing angle. I will order more for use at work and for inexpensive gifts. It's perfect for travel or on the go! Basically, you can bring it with you everywhere since it's so tiny, light, and it holds my gadget safe and secured. Get yours now! Worth the price! I like how they are easy to fold & fit in the small pocket in my purse. Very handy for watching moviews during waiting times! Perfect! I've been using for art display purposes and since I travel on plane a lot space in my bag is vital when packing. This is compact, lightweight, and hold the phone at the perfect angle. I just love versatility! I use it on my nightstand next to my bed to hold my phone. It holds my phone both vertically and horizontally making it easy to access for better viewing. Very helpful! Lightweight but very sturdy. The unit is small when folded but easily holds my phone in a portrait orientation and the height is exactly right for me. My perfect travel companion! Great quality and it works like a charm! The phone stand came promptly and nicely packed. It holds my phone safe and secured. I can carry it anywhere! 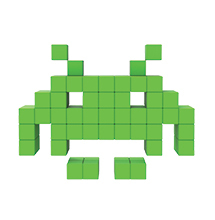 Thank you, Geeks! Adorable! I bought one for the office and one for the nightstand. Completely stable when holding my devices even when I'm tapping or swiping the screen. Such a great deal! It can be quickly and easily adjusted to a wide variety of viewing angles. This is one is very sturdy and folds up nicely for portability. Finally found the best phone stand! This is lightweight, small , and portable. It's compact enough to fit in a side pocket of my backpack yet folds out to a size that accommodates my gadget. I love this little stand! The unit is small when folded but easily hold my phone in a portrait orientation. It feels more solid, sturdy, and seems made of very good material. Worth buying! Portable and very useful phone stand! This stand adjusts angles and folds up conveniently to fit in my pocket or pouch. Functional and handy to carry around! Great kickstand and perfect for a phone or small tablet. It folds up really small and unfolds easily. This is sturdy, durable and compact which is great for my pocket or backpack for traveling! Best buy! Pictures make this stand look small. Actually, it is very, very small! Good size for my kindle voyager, it is strong and sturdy. Adjust the viewing angle just the way I want it to fit. Just what I needed. I was pleasantly surprised by the quality of this stand. I can use for my gadget for reading a cookbook while in the kitchen, watching movies, and simply texting. Multi-use for sure! Exactly what I was looking for. It's sturdy and folds up so I can carry the extra one in my purse or tote bag if needed. Worth buying! I got this to hold my phone, I sit my bed pillow on my lap and then this stand on top of it. Small, compact, and easy to use. I can carry anywhere I want! Satisfied customer! Works great and easy to take on the go! Very simple, works well, especially for a long flight and it folds flat so it easily fits in my purse. Very pleased with the purchased. Super handy. It holds my phone safe and secure. 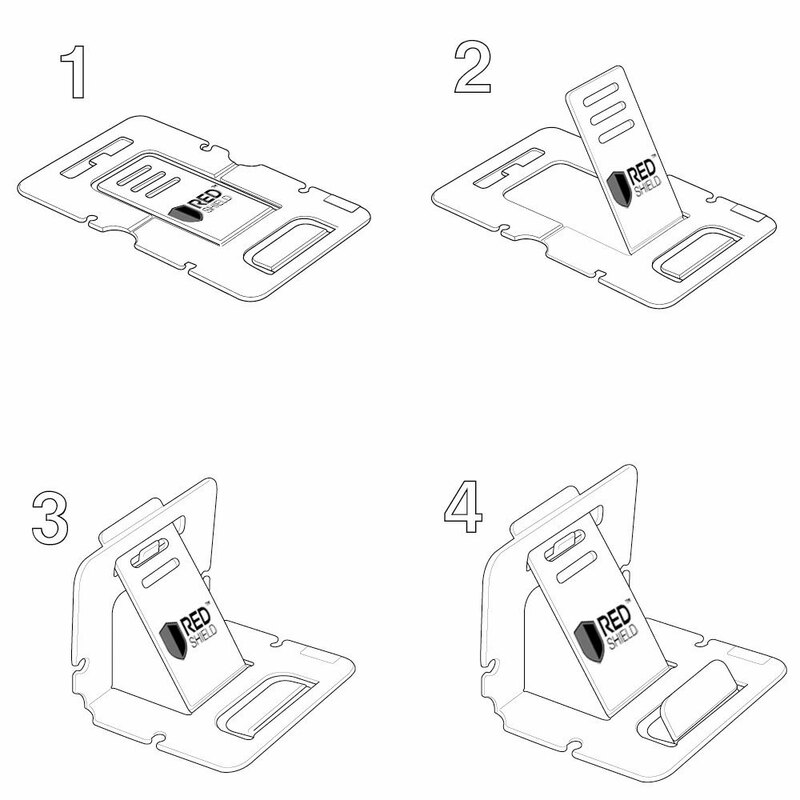 Fold/unfold easily and it's very convenient to have various angles. It seems sturdy and looks like it will last! Portable and very useful phone stand! This stand adjusts to different angles and holds up conveniently to fit in a pocket, pouch, and I can simply flatten and perfect for traveling! Next, to my coffee maker, I used this product every day! Small enough to fold up and fit into my pocket. It makes easy with my phone to view hands-free and it has several adjusted positions. Very clever design! Simple design that works efficiently and is surprisingly pleasing. I travel a lot and needed a desk stand for my cell phone. I was able to completely fold it flat for easy storage. It is well built in and very compact when folded up. I can slide this stand in my pocket or put in the cell phone travel case. It is lightweight, adjustable angles, and quite convenient. Perfect for traveling! Such a clever phone stand with flawless engineering. This is strong, durable and versatile. Can be quickly and easily fold/unfold/adjust into a wide variety of viewing angles. Small when folded. It's much stronger than you may think it is. It holds my gadgets with supreme confidence! As soon as you feel the weight of it you know it's gonna be super solid! Great for travel! Great purchase at a great price. The stand are basic but decently made. I was able to give one to my daughter, my wife, and keep one for myself for both home and work. It fold down and portable on the go! I love these things! They are very lightweight but durable and they fold flat so perfect for my baby's little tablet carrier. Perfect for every travel! Perfect! I'm using this while I'm playing games or watch videos! It stays in place, I like that it has several angles and it's very compact!. Then I can simply flatten it and stick in my pocket or handbag. This substantial stand is so perfect for my phone. It easy to fold up for travel and doesn't take a lot of counter space. Love it! Will buy more for gifts this coming Christmas! Portable and very useful! This stand adjust to different angles and folds up conveniently to fit in a pocket or pouch. Easy to tap the device when it is propped up in it! Perfect! Great bang for the buck! Very nice to get a quality adjustable stand, like this for such a low price. Easy to fold up and put in my jacket pocket for travel. Also, use it on my desk at work! Finally found the best phone stand. This is small, compact and strong enough to hold my phone. It is much more secure and an adjustable stand that fits for my needs. Big thumbs up! It holds my gadgets with supreme confidence! I can quickly and easily set it to a multitude of angles by pushing the hinge. This stand is versatile, great value, and excellent for travel. Works great, easy to use and easy to adjust! It's been a great stand to prop up my phone that I am using for work. The adjustability allows for an easy read no matter angle I am sitting. Many thanks! Awesome phone stand! They fold flat and fit in my pocket easily. Great for streaming movies or watching funny clips together! Cool simple design and perfect for travel! Cute and practical phone stand! I have had this product for more than 3 months and it works great! It holds up my smartphone just fine, lightweight, durable and easy to take around! Made of premium plastic but definitely not flimsy. It folds nicely and no parts seem loose or easy to break. This little stand is sturdy enough to hold my phone. A great gift idea for Xmas! Great affordable stand. It helped me turn my phone and I have found the various positions that can be adjusted a nice fit for my needs. Bring It anywhere I want! 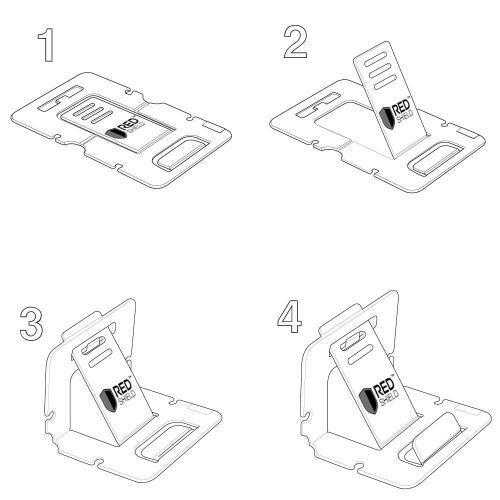 Very easy to use, fold, and unfold. This little stand is perfect for propping up my tablet in landscape and portrait mode. Being able to adjust the angle in any position. This little stand is awesome! It's much stronger than my previous stand. It holds my gadgets with supreme confidence, collapsible, and adjustable. It seems made of very good material. I feel it's sturdy and well made. This is lightweight, durable, portable and inexpensive. I am impressed that such an inexpensive item can be so well designed. Love this little thing. Finally found the best phone stand! Found this foldable, portable that was perfect for my needs. In this stand is much more secure and adjustable. Perfect for travel! Clever at a reasonable price. It's simple, sturdy, and versatile. It allows in a variety of devices and be able to stand the devices vertically, horizontally at many angles. Worth buying! Pretty awesome! This little phone stand is small, durable, flexible, collapsible, and hold my phone securely. Very easy to throw in my pocket. Happy! I like this stand. It keeps the phone from getting hot while charging. Easy to move from room to room. This is versatile, great value, and excellent for travel! Well designed! This phone stand helped me turn my gadgets and I have found the various position that can be adjusted a nice fit for my needs. Great travel companion! Thank you for this wonderful product. I use it all the time. It holds my phone while I am watching videos, chatting, reading and more... It folds flats and easy to carry. Very satisfied! Great support for my smartphone and for my kindle. It folds easily, holds securely without slipping and small enough to slip into my bag when I am on the go. Great for travel! Stand is simple, nice, sturdy and can be adjusted to any desired angle we prefer. It is very light yet very strong to hold my phone and carry it with me in my purse which is a big plus. Happy. Very pleased with the purchased. It collapses, adjustable, and fold/unfold for easy travel. I'm considering purchasing another one so I can leave one at the office and one at home! Very sturdy construction and can be quickly/easily adjusted into a wide variety of viewing angles. My great travel companion! Best buy! Simple and elegant looks! It has a perfect angle of view when using facetime, watching films, playings games, viewing photos, reading, and typing. This is a clever device with flawless engineering. Used the stand horizontally/vertically and the devices always remained secure in this stand and did not slide on the surface of the counter. Bottom line: Versatile, great value, and excellent for travel. It folds securely without slipping and small enough into my purse when I am on the go. My travel companion! This is small, well made, adjustable and hold my phone securely. Easy to use and even easier to fold up and throw in my backpack or purse. It's a little smaller than what I expected and it holds up my smartphone just fine. It's very easy to carry around, durable and doesn't slip around. Love my little phone stand! A clever and cute accessory for my phone. It comes in handy, sturdy and can be adjusted to any desired angle we prefer. I can carry it with me in my purse which is a big plus. Awesome! Small, simple and it works great! This stand is very inexpensive but it is so strong and stable that it barely moves. No sliding or falling flat! Excellent value for the very low price! I love this little gadget! It fits in my pocket, very versatile and stays in place with the little cut outs. And I like that is small enough to keep with phone and flexible in having some options for angles. Great for use in my office! I like that I can adjust the stand on different levels. This mini desk stand can provide a safe and secure for my gadgets. Browsing the web and other hands-free operation. A nice little stand to hold my phone while I am reading or entering data. It easily folds, flat and adjusted for easy carrying. Works great! Used this phone stand for more than a year now and still works great! This is small when folded, solid, and the height is exactly right for me. My travel companion! A nice little stand that hold my phone while I am reading or entering data. It folds flat for easy carrying, adjustable and neat. Worth buying! Works great! I bought this for my mom, and she says, this is cute, easy to carry and functional. She bring it anywhere and very useful. No more drop calls. Wow! Great "bang for the buck"! Easy to fold up and put in my jacket pocket for travel. Use it on my desk at work and on the nightstand. Very useful item! Great design. Folds up flat so it takes up zero room when carrying it around. I bought two more so I'd never be without one. Brilliant product and it well made. I bought two and they make using our smartphone so much more convenient to use on a kitchen counter-top, workbench, desk or table. Totally functional and helpful to my life! Small and sturdy stand. It makes my phone feel more secure, fold, adjustable and it's easily for transport. Awesome Stand for my phone/tablet! I used this stand for my kitchen counter or live streaming. It held very well and planning to order another one for my hubby. Happy! Life saver! I love to watch movies when I am cooking and taking shower this works so great! I love it so much. Great value for the price! Would recommend for sure! Great stand for my iPhone X. Perfect for watching video while on the desk and being able to see the screen when I get texts or email during the day. I was pleasantly surprised by this cute little stand! Very versatile, lightweight, and perfect for holding my phone either horizontally or vertically. I can carry it in pocket or purse. Works just fine and it looks pretty cool! I bought this to hold my gadgets, very easy to use, fold and unfold. Perfect for travel! Well made, adjustable and holds both phone and tablet. It could use a little larger grove but is sufficient for protection to stay on both devices. I carry one in emergency bag for travel. This stand is great for portability since it folds down flat and can be thrown in a bag or purse without taking up a lot of space or causing a bulge. Adjustable angles are perfect, my great buddy travel companion. Fantastic stand, simple and highly functional! Perfect for watching video while on the desk or being able to see the screen when I get texts or email during the day. Very nice little stand for my iPhone X. This is solid, well built, and adjustable angles. Perfect for watching video while on the desk, especially during travelling. Best little cell phone stand! I just bought a S8 Plus and wanted to be able to stand it up or lay it sideways with a case on it. It works both ways. Angles are great and functional. I would definitely buy again. Pretty cool! Got one for me and one for hubby. They definitely hold our phone. It's exactly what we needed, especially for travel. Would recommend this type of phone stand. Works good! I got this to hold my phone securely. I sit my bed pillow on my lap and then this stand on top of it. Collapse and fold for easy travel. I'm considering purchasing another one for my hubby! It's fold very flat, adjustable tilt, lightweight, and can fit in the pocket. I would recommend this to anyone who wants to have a hands-free especially if you are trying to read a recipe in the kitchen. Well made quality phone stand, very sturdy, and it is easy to case in my purse. I have a pretty big and kind of heavy phone and it stays in just fine! Feels solid and well design. This is perfect for my phone, so it looks great on the desk, and feels almost as if the phone is standing straight up. Great little stand! Just got it recently and is perfect for my phone. It folds up really small and unfolds easily. I was really impressed on the design and construction. Perfect! Works good! This little gadget is a must have for sure, it fits in my pocket, very versatile, stays in place and works well! Would recommend this type of phone stand. Great little stand, perfect for my cell phone, folds up really small and unfolds easily. Constructed very well and I was really impressed on the design and construction. Exceeded my expectations! An excellent bargain for a stand that finally gets it all right! The design and execution of this stand are great, the angle adjustment is smooth and tight. The finish is flawless! Works as it should! It's been a great stand to prop up my phone that I am using for work. My perfect travel companion. Love it! Best deal for the price! This is the best little cell phone stand. I just bought it to be able to stand it up or lay it sideways with a case on it. The angles are great and functional. Simple design that works efficiently and is surprisingly pleasing. I wanted an inexpensive, collapsible stand for my gadgets and this does the trick. I was surprised how flat it folds. I love this little stand! It collapse, fold able, and solidly adjust to suit any angle and hold that no problem. Great for travel and plan to buy more for office and one at home! Good quality phone stand! I have had this product for more than 2 moths and it works great. This is lightweight, very useful, easy to take around, and makes a good gift. Great support for my smartphone and for my kindle. It folds, collapsible, and it holds securely with slipping. Compact enough to slip into my bag when I am on the go. Good product for a good price. Such a simple design, collapsible, and adjustable viewing angles. I bought this for a trip to use on a plane and I found this is very useful and comfortable to use. Wonderful phone stand! Folds easily, holds securely without slipping and small enough to slip into my bag when I am on the go. The compact size and portability of this phone stand is great. I travel a lot and needed a desk stand for my cell phone. It holds up my phone very well. Pretty cool! Got one for me and one for my hubby. They definitely hold our phone and works good. This is compact, collapsible, easy to fold. It's exactly what we needed. Especially for travel. I got this for my dad. He was always leaning his phone against things. It's always at the kitchen table so he can eat and read at the same time. Strong, durable, and excellent for travel too! Great kickstand and perfect for my phone. It folds up really small and unfolds easily. I was really impressed on the looks, feels solid and well construction design. Works like a charm. This stand is very useful, sturdy and small. The angel of support is easily adjustable, great for holding a phone in the kitchen while following a recipe on the internet would also travel well. I'm very pleased with this as I have arthritis and this phone stand was very helpful from holding it. Highly recommended. Such a simple device but it's really effective. It folds very flat, collapsible and provides strong hold to the phone. Glad I bought it and leaves my hands free for coffee cup or snacks. Great for use in my office and it;s perfect for travel or on the go! Basically, I can bring it with me anywhere since it's so tiny and light. This is good, quality, strong, and durable. Great price! A great tool to help catch-up on over-night emails and texts in the morning. Love the adjustable of the stand that allows me for an easy read no matter at what angle. Awesome! Good value! I use it every time I want to watch a video or listen to my music while cooking. It's perfect to keep my phone where I want it to be. The style of the stand is very simple and good to look. I video chat with my parents every week and I feel good every time I use it, it has already made my life easier and more convenient! Great support for my smartphone and for my kindle. Folds easily holds securely, without slipping, and small enough to slip into my bag when I am on the go. Adorable! I bought this for my office and am planning to get one for my home. The quality is even higher than I expected. Collapsible, foldable and very strong to hold my phone. Great for the purpose! I love this little stand! It's perfect for travel on the go, I can bring it with me everywhere since it's so tiny, compact, collapsible and light. And the price was perfect for function and use. Nice and attractive phone stand! This is strong, durable, and can be adjusted to any desired angle. It is very light yet very sturdy and I can carry it with me in my purse which is a big plus. I am so glad that I got this stand for my phone. This stand is strong, durable, and sturdy enough to hold my phone. Very useful stand to have and perfect for my travel. It's much better quality than I was expecting. I'm using it to hold my phone perfectly, in either direction and there is no wiggle or feel like it might fall. Very sturdy and durable material. As a college student, I'm always using my iPhone when I'm studying looking over notes and watching videos while I'm eating. This phone stand was strong enough to hold my phone, does the job well! Perfect for travel on the go! Basically, I can bring it with me everywhere since it's so tiny, light, and holds my phone securely. Great stand and earbud cord organizer! Perfect! Use it on nightstand, kitchen, living room while watching tv, I take it everywhere since it's so tiny and light. Practical and great price for the job! Basic, stable and wonderful little stand to hold my smartphone upright. Great that it easily folds flat and can along with me while traveling! Great kickstand and perfect for my phone or small tablet. It looks great on the desk, feels solid and well designed. Also, can fold down compactly perfect for my travel. Just what I expected. This is good quality, very useful, and makes a good gift. A perfect size for carrying around, my grand-daughter loved the compact size. Love this little gadget is a must have for sure! It fits in my pocket, very versatile, and very functional. I like that it is small enough to keep with phone and very flexible in having some options for angles. Great support for my smartphone and for my kindle. It folds easily, holds securely without slipping. Small enough to slip into my bag when I am on the go! Awesome! This is made of premium plastic and definitely not flimsy. It folds nicely and parts seem loose or easy to break. My travel buddy companion. It was a great purchase at a great price! The stands are basic, but decently made, and quality made. I was able to give one to my daughter, my wife, and keep one for my self. Pretty cool! These are really handy and incredibly portable. I use them all the time, stable, lightweight and totally packable. So, I keep one of them in my travel bag. Glad I bought this. This cell phone stand meets all my desires for propping up my phone to read or to watch my favorite movies. Easy to stick in my purse or pocket. Perfect for travel on the go! It holds up my phone and my kindle and pick what wangle I wanted. It folds down perfectly and it doesn't take too much space in my pocket. Perfect for propping up my phone and organized my earbud cord. Awesome buy for the best deal! Might get one for my desk at work as well. Pretty much and this is what I was looking for. A nice little stand to hold my phone while I am reading or entering data. Folds/flats for easy carrying. Great design! This is compact, lightweight, and strong just enough to hold my phone securely. Easy to fold/unfold and perfect for travel! Such a simple phone stand! They fold flat and fit in your pocket easily. Great for streaming movies or watching funny clip together with my sister. Good value, sturdy, and collapssible phone stand! it raises my phone up for easier reading and watching movies for better viewing. Great in every travel! Very nice stand! I bought one for myself and one for my wife. It was a well built, sturdy and durable to hold my phone securely. Awesome! I'm very happy with my purchase. These are so useful, portable, and so simple. I can bring stand and comfortably watch my movies anywhere I want! Folds up quite and opens up to hold my phone securely. This is sturdy and well built. Very good profit for desks or airplane tray tablets! The stand is basic but decently made. I was able to give one to my daughter, my wife, and keep one for myself for both home and work. I like that they fold down flat to make them portable on the go! Fantastic! This phone stand has been very helpful while I am cooking and reading the recipes. It has made cooking much easier and fun! Great little stand. It works perfectly and folds up into a lightweight and very portable stand. Highly recommended. Great support for my smartphone and for my kindle. It folds easily, holds securely without any slipping. This is small enough to slip into my bag when I am on the go. Best phone stand! I bought this for a trip to use on a plane but I have found that i"ve incorporated it into my everyday carry since it provides so much functionality and perfect in my pocket. Great kickstand and perfect for my gadget. It feels solid, well design, and fold down compactly. Its sturdy and doesn't slip. Perfect! 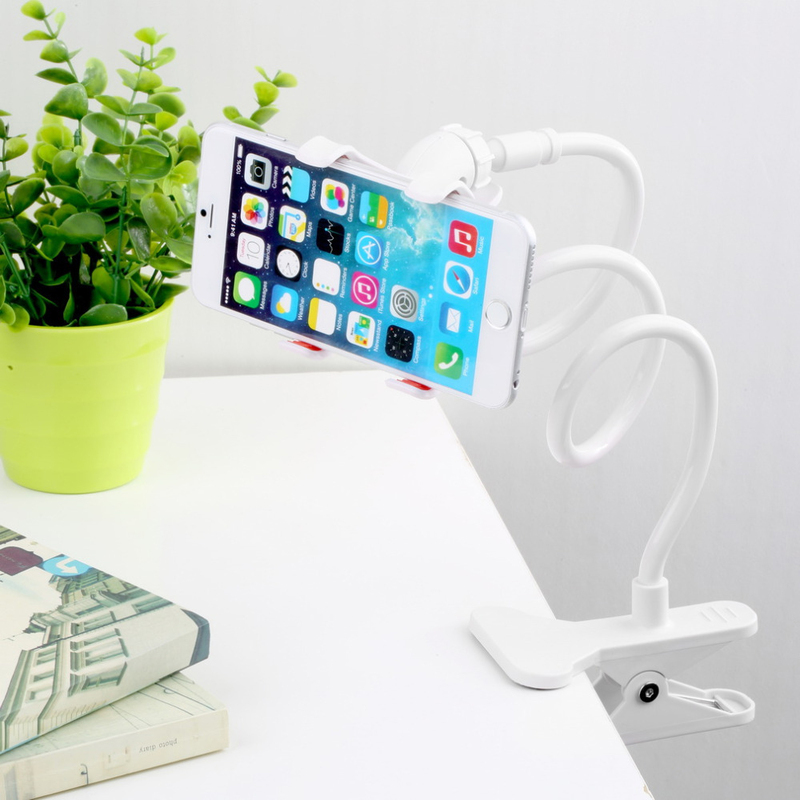 I ordered this to keep my phone upright on my desk when working from home. This is thin, strong and lightweight. Perfect for travel on the go at a great price! The best thing for my sanity that I have ever bought. It holds my phone with no wobbling or stability issues and it is easy to adjust to how I need to view it. Used in the kitchen, bathroom and anywhere! My great travel companion! It's perfect for travel on the go, basically, I can bring it anywhere since it's so tiny, light and it holds my phone well. Perfect stand for my phone! It's inexpensive, lightweight but sturdy and versatile. Can be quickly and adjusted into a wide variety of viewing angles. Good quality product and this little stand are perfect for propping up my phone. Very convenient to use anytime, anywhere! I'm glad I bought it! My Travel Buddies companion, this is small, lightweight and strong enough to hold my phone. I love the adjustable viewing angles. Works perfectly! This is small, portable, and durable enough to hold my phone. I travel a lot and needed a stand like this. Very useful and functional! I got this for my husband he travels a lot and this stands was really helpful. The adjustable table stand is all folded up, its pretty sturdy, and then adjust it to the level and angle that he wanted. Perfect stand for my tablet and phone! It's expensive, lightweight but sturdy and versatile in that easily adjust to hold my gadgets. Highly recommended. I bought one for me and two for my sisters. We even ordered two extras to leave in the living room and on the patio. Great for streaming movies or watching funny clips together! Cool simple design! Love this little guy! It is built well, compact when folded up. I can slide the stand in my pocket or put in the cell phone travel case if I wish. Glad I bought this. I travel a lot and needed a desk stand for my cell phone. And this little guy is very helpful and sturdy enough to hold it. Fold up really small and unfolds easily. Very impressed! It's simple and it works well! Quite ingenious that it folds, flat, and is easily adjustable. Perfect into my pocket and take it on the go and travel! Works just fine and it's cool! This is simple, foldable, very thin and perfect for travel. I use it almost every day to hold my gadgets. It fits easily in my pocket or purse. I like the way this stand folds almost flat and is light enough to take while traveling. This is portable, very useful and adjusts to different angles and fold up conveniently! I bought one for me and one for my sister. Great for streaming movies or watching funny clips together. Cool simple design and arrived quickly! I'm very happy with my purchase. These are so useful, simple, portable and convenient to watch movies anytime, anywhere! Well made of premium plastic. My great buddy companion. Worth the money! Very useful and this stands adjusts to different angels and folds up conveniently to fit in a my pocket or pouch. Great travel companion! Handy and very useful phone stand. Use them in several rooms throughout my place. Surprisingly sturdy considering how slim it was. Holds up my phone securely. Totally worth the extra dollar from this premium plastic. It holds my phone securely, folds up for easy storage and conveniently cord wrap around. Good deal for the price and functionality. Well made, adjustable and holds my phone on a convenient way. Bring it every time I go travel.Great price! Clever design! It's small yet big enough for my phone or kindle. Great for watching or reading in flight because they don't take up much room on the tray of the airline seat. Awesome! Great little stand! Perfect for my phone and my needs. This is compact, strong and fold able easily. I was really impressed on the design and construction. My good companion in every travel. Just what I needed. This stand is small, durable and very stylish. This has been an excellent addition to my travel gear! Fits easy into my pocket. Awesome! Completely satisfied! This little stand was handy and portable. Love having them on desks and bedside table as well as at coffee shop so I don't have to hold my device constantly. Very useful. Nicely adjustable and well designed. Great for using my phone to watch movies on airplane, taking group photos, or just propping up my phone at my desk. Folds flat which was a criteria for my selection. It's really nice designed, lightweight, and functional. Hold up my phone just fine and it's adjustable and the small size is a benefit. Easy to carry around. Wonderful phone stand! We just used this on our recent flight to hold up my phone with ear buds attached. Easy to use, small, and folds flat to carry in my pocket. Would buy again! Great little stand! It fold up and very compact when not in use. Quick, easy to use and hands free viewing. Excellent addition to my travel gear! Fits easy into a pocket in my laptop courier bag along with my earbuds. It's cool! Thanks Geeks! Very easy to use, fold and unfold. Holds my phone safe and securely. I love the fact that I can adjust its position for my comfort of viewing. Awesome! The compact size and portability of this is great! I am able to use this with a case on my phone. Perfect for propping up my cell phone. It's quite ingenious in that it folds flat and is easily adjustable. I have had this phone stand for more than a year and it works great! This is lightweight, easy to take around and very quick easily adjusted into a wide variety of reviewing angles. Worth the money! Very useful! It works great, hold my phone safe and securely. It is easy to case in the purse. My great travel companion! Hold my phone nicely, handy and portable. I love having them on desks and bedside as well as at coffee shop so I don't have to hold my device constantly. Works perfectly! Very compact when folded, lightweight, adjustable angle and nicely props up my phone. I enjoy using it especially for video calls or such when my hands are busy doing something else. Super sturdy and it works great! It's simple and does what it's intended to do and that's hold my cell phone safe and securely. Perfect for travel and in my pocket! Truly wonderfully! I love this stand for my cellphone especially at at work and even on travel. Love also the quality, functionality and perfect on my pocket! Great value! The stand is very strong, durable and firm without busting a sweat. This is my great companion during my vacation. I love this stand for my cellphone especially when at work and every travel. This is small, compact and perfect for my wallet. Love the stylish and functionality. Worth the money! This is practical, sturdy and very affordable. Perfect seeing my phone while I am at my desk. Such a versatile stand. I have it on the top of my table, on the coffee shop, in the office and anywhere I want! Hold my phone securely and keeps the device from slipping. Perfect on my desk , at home and at my office. I used it everyday and great for travel too! Small, sturdy and simply design. I love it! This stand holds my phone perfectly and is quite stable. I will probably order a second one for the office. Great travel companion! Compact, lightweight and super handy to have right in front of my laptop. I use it everyday and this phone stand works well fro out of the box. It is worth the value and I will consider for future purchase. Love how it looks and feel on my desk! A great solution for multitasking while using my phone and writing. Glad I purchased this. You should too! Simple, stable and for me this is excellent product! I use it in the kitchen to hold my phone while I'm cooking. I use it at my desk for an easy view of phone while working at the office. and anywhere I go! Very useful and functional. Just got it today and I have been using it all day! This is small, lightweight but heavy duty stand for my iPhone 6S. This is perfect on my desk at home and at my office anywhere! It holds my iPhone 6 S nicely, sideways so I can watch my video in comfortable way. This is small, simple and does what it is supposed to do! Works great! Great little stand. Fits in my pocket, simple and well made I use it all the time. They are sturdy and stable and will hold my phone vertically or horizontally. Fold flat when not in use. Small but sturdy! This is deep, durable and strong enough to even hold my phone in portrait position! Works great and easy to case in the purse. Fast shipping. Love my little phone stand. Great for watching movies on airplanes, taking group photos, or just propping up my phone at my desk. Folds, adjustable and flat which was a criteria for my selection. Quick, easy to use and folds flat to carry in my pocket. It will come in handy when I go on vacation! Solid built for the price. Functional and very useful! It holds my iPhone safe and securely. I like the adjustable setting for my convenience. Perfect! Affordable, compact, strong and it hold my phone safe and secured. I love the functionality and doesn't move around easily. Awesome! It's a little smaller that what I expected but it holds up my smartphone just fine. Easy to carry around, sturdy and adjustable. Very sturdy it doesn't slip around. Very inexpensive but just what I wanted. Very good smartphone stand. I use it all the time! Cute and practical! Have had this product for more than 2 moths and it works great. This is lightweight, easy to take around, my travel companion. Smart and sturdy! This is good smartphone stand, inexpensive, and adjustable just what I wanted! I use it all the time. Love it! It holds my phone perfectly! Great for using my gadgets to watch movies on airplane, taking group photos, or just propping up my phone at my desk. I can fold, collapse, adjust, and very convenient to use! Perfect compact size, sturdy and super value phone stand. It can fold nicely and is easy to tuck into my pocket. Good for airplane travel! Wonderful phone stand! Next to my coffee maker I used this product everyday. This is well made, strong and collapsible. The rubber footings so stable and quit. Convenient to bring anywhere! It's a little smaller than what I expected, but it holds up my phone just fine. It's adjustable/collapsible and the small size is a benefit. Very easy to carry around and very functional! It holds my phone securely and give a perfect angle to allow me to watch my video on hands free viewing. Very convenient to bring anywhere! I truly love this little phone stand. Exactly as was described. Extremely solid construction, very light and looks more handsome my phone in this holder. Ordered more as a give away this Christmas! Just the right angle and very attractive. It makes my phone very usable without having to hold it. Super love it! Finally! A cell phone holder that will hold my phone when it's inside its case. Bless this company and this nifty little gadget, my perfect companion on travel. Extremely solid construction, It's very light and looks good. Very functional, durable and it will help me with my viewing angel when browsing my phone. Perfect in my wallet! Very sturdy, nicely made little iPhone stand. This is fold able, strong and very useful. Now I can bring stand for my device without requiring a lot of space and weight to my bag. Indeed an awesome item! I love this handy little stand! I use my phone at work all day to communicate with out staff and I was always propping it up on something for better. Fits perfectly, keeps it from slipping and sliding. Perfect in my pocket at ridiculously inexpensive. Perfect on my desk at home, at my office and great for travel. Very nice and tall enough to see it over tons of paperwork. Lightweight, sturdy and perfect in my pocket. Exactly what I was looking for. This stand is small, adjustable and very convenient to use. Perfect in my wallet and travel as well. Very good quality and price! Gorgeous! This phone stand works well from out of the box. It is stable and when I put my iPhone on the stand, it is able to fit nicely and balance. Worth the value! Neat little stand, pretty much what I expected. This is small, simple and perfect for my desk. Definitely worth the price. Great! This is a lifesaver! It holds my phone perfectly! I even take it with me when I travel, the angle for the phone is perfect to watch a movie. Very stable. Exactly what I was looking for. Perfect phone stand that I used so far for travel and in home/office setting. Works great! Good quality, very useful and makes a good gift to someone dear to me. This stand adjusts to different angles and folds up conveniently to fit in my pocket. Awesome! Very satisfied! This is really a nice, sturdy phone stand which can be adjusted to any desired angle we preferred. It is very light I can carry it with me in my purse which is a big plus. Awesome! Great little stand for my phone and small tablet. This is portable, adjustable and very useful. Conveniently to fit in my pocket to fold up when not in use. Perfect! A simple, simple, lightweight but heavy duty stand for my iPhone 6S. 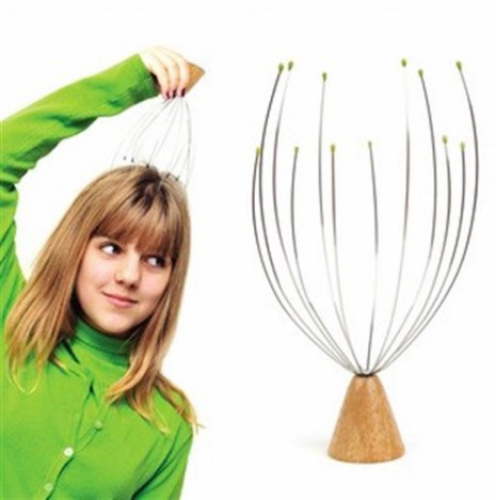 I use it in the kitchen while I cook and in my room while watching movies or play sleep music. Also my great travel companion! High quality and it looks great. It fits on the stand perfectly with the case on it. Great for putting on coffee table while playing video games or watching TV. Great travel companion! Such a versatile stand. This is high quality, lightweight and durable. I have it on top of my vanity table, where I spend most of the time. Keep my phone secured and it fits either vertical or horizontal viewing. Holds my iPhone 6S nicely, side ways, so I can watch a video, or facing up as just a stand. Fits, nicely and stable. Super like the adjustable settings. It does what it is supposed to do! A simple and elegant cell phone holder! Very neat appearance on my desk and just the handiest gadget at a ridiculously inexpensive price. Very convenient and functional! I really love this stand. It's simple and does what it's intended to do and hold my phone secure and safe. Very convenient and very functional. Thinking about buying another stand in the future. Great little stand! Its sturdy, strong and it doesn't slip. Both are held very well in vertical and horizontal position. The adjustment makes perfect and excellent gifts to love ones. High quality and it looks great! This is such a versatile phone stand, durable and strong. It also keeps the phone from slipping. Perfect on my wallet! Perfect! It stays in my wallet and goes with me whenever I go. This provides a perfect solution without being bulky. It can folds up flat and slides into my wallet when not in use. Great product! Gorgeous! This phone stand is strong, very sturdy and functional. It fits perfectly and it doesn't move and looks very nice. Perfect on travel. A great travel companion! It fits right into my wallet and I typically use it on airplane or at work on my desk. The support mechanism on the back seems sturdy enough for it. A great, lightweight, and very functional phone stand. This is made of strong, well made and high quality material that safely secured my phone. Super thin so I can carry it in my pocket. My travel buddy. Yes! Totally love this! Perfect for my iPhone 6S, it's sturdy and I'm glad its super thin, small and durable. Perfect in my pocket and great in every travel! Best phone stand. I bought this for a trip to use on a plane but I have found that I've incorporated it into my everyday carry since it provides so much functionality at a bare minimum cost of space in my pockets. It works! Extremely satisfies with the performance, functionality and very convenient to bring anywhere I want! A hands free viewing, best buy! Excellent quality! This is great phone stand! it holds my kindle in place and it doesn't slide off when moving. It's adjustable so I can move it. Perfect travel companion! Super cool! Next to my coffee maker I use this product everyday:) Well built, compact, collapsible design and great viewing angles. Great to carry in my pocket. Perfect! I absolutely love this fold able smartphone stand. It is heavy and sturdy and my phone looks great sitting on it too. It also looks great on my desk keeping my phone ready available. Just love it! Excellent design. materials and functionality! This is small, and flexible and collapsible that great in my wallet. Just what I wanted ... with style! It great's, simple and well made. This is such a versatile, compact and perfect on my wallet. It also keeps the device from slipping. Great phone stand! This is very sturdy, the bottom space is very generous so it holds my phone even with a thick case. Perfect in my wallet and great buddy in travel. I really like this phone stand! It puts my phone a pretty much perfect angle sitting in my desk. It's simple and elegant. Perfect on travel and with wallet size. Perfect! Pretty and well made little stands. Great for travel, very handy, and functional. It fits and good in my wallet, solidly made and great value for the price. Great product! Great for travels. This is small, collapsible design, and I can carry it in my pocket with my wallet. It provides so much functionality at a bare cost of space in my pocket. It's great, simple and well made phone stand holder. It would be really cool to bring anywhere in my pocket. A perfect companion especially in travel. Smart buy! It is very useful, functional and very convenient to use in everyday work. Easy to stash in a pocket or you can bring it anywhere! Small, portable and very useful. This make great gifts for my love ones and perfect for my travels. I got a couple to use at home and work. Great little gadget! This little gem works great! It has a soft grip to secure my phone, durable and perfect in my wallet. My daughter and I watched a movie and this came in so handy to sit the phone on while we watched. Pretty cool! This little stand holds my phone securely. Works well. slips into my wallet easily and doesn't deform from sitting on it in my wallet. Looks like it should have decent longevity. Very thin, small and this is awesome to holds my phone switch nicely. I keep mine in my wallet to use when ever I go. Highly recommended. Great product! I bought this for a trip to use on a plane, and I like it! It is collapsible design means I can carry it in my pocket in my wallet. 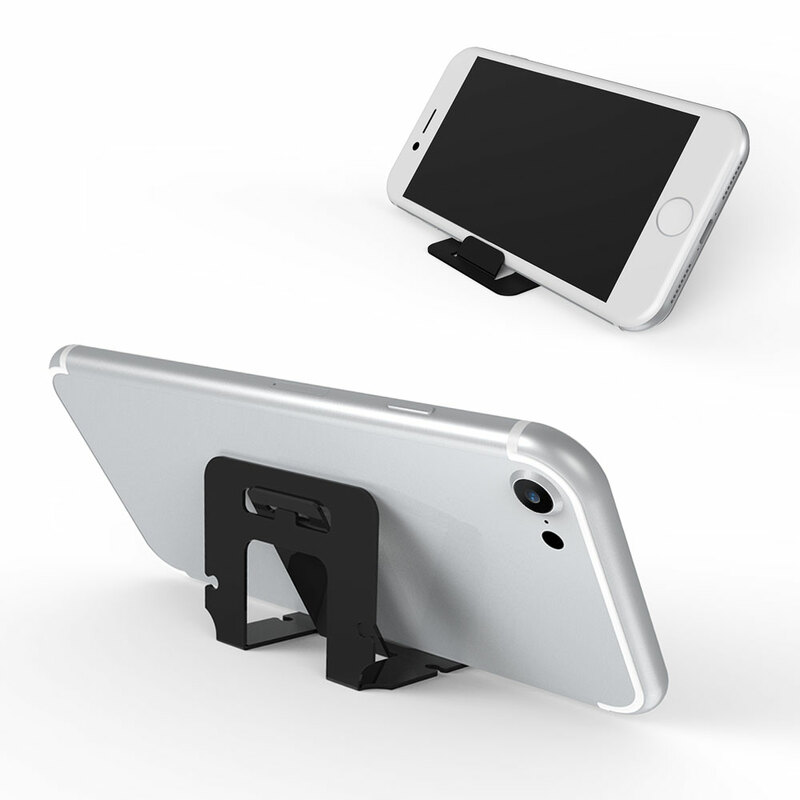 Adjustable viewing angles, best smart phone stand! I am really happy with this product. Small and sturdy. Made of well materials and it really holds up to everyday use at work or even in airplane. My great buddy companion! Perfect in my wallet! Small, lightweight and very transportable. It is strong enough to hold up my smartphone in a perfect position to watch movie or to make Skype call hands free. Design is ingenious about the size of a credit car. This is fantastic! It is sturdy, small, functional. Which is what I need. I purchased it for sole of being able to watch movies on an airplane with my iphone. Perfect on my wallet. I'm very happy with this phone stand. It holds my phone fine. Small, very convenient, functional and well designed. Perfect in my wallet. I bought this for a trip to use on a plane. I'm pleasantly surprised, this is the best smart phone stand. I love this collapsible design means I can carry it in my pocket with my wallet. Perfect for travel! This is great, small, durable and can hold my phone safe and securely. I keep mine in my wallet to use where ever I go. Awesome! Happy with this product. Small and sturdy. It really holds up to everyday use at work. I wanted something small that I could fold up and put away at night. Perfect in my wallet. Simple design but works perfectly as a stand for my phone on my desk. Small, sturdy and elegant. Perfect size in my wallet. Absolutely love this stand. It's simple and does what it's intended to do and that's hold my cell phone. Very functional and convenient to bring especially on travels. Small and fits in my wallet. Wonderful stand! It looks great and holds my iPhone where I can see the screen easily. This is sleek, simple and functional, I can bring it anywhere I want. Perfect in my wallet. Nice little phone stand! This is very functional, sturdy, and the fits was great. All in all it's a very simplistic and functional design. I am very happy with the stand and plan to order a few more. Small, sturdy, useful and very functional. It really holds up to everyday use at work. I can put it in wallet now, I use it anywhere I need. Awesome. Excellent product! Nice wide slot to hold my phone, well put together, super thin and durable. Pretty slick and slides into a slot in my wallet. Functional! Super light weight and as a credit card. Easily tuck into my wallet or pocket. Convenient to bring anywhere I go and the quality was guaranteed and durable. Price was good. Works great with my expensive investment in portrait mode. A gem for travel and great in my wallet. Very convenient and functional. A great idea, the size and it's composition of materials that make up this stand is outrageous. A perfect example of technology. handy, comfortable and very convenient I can bring it anywhere I want! Awesome product! It's compact and it works! Fits wonderfully into my wallet and holds my phone perfectly! Very handy! Easy to use and so convenient! Small item that made ten camping and watching an iPhone movie pretty easy without always fixing my phone! My husband love it! Great phone stand! It stays in my wallet and goes with me whenever I go. It fold up flat and slides into my wallet when not in use. It's almost as thin as credit card. Very functional. Holds my phone perfectly! Made of sturdy, well made quality and it really holds up to everyday use at work. Easily snap into place and doesn't take much space in wallet. Perfect for travel! I love this phone stand, small, and handy. I got this from a friend, and I plan to buy more as a gift also to my love ones. Great gift ideas! Perfect! Small and sturdy. A gem for the travelers! Takes up no more room than a credit card. I am really happy with this product. Perfect for my viewing purposes. This is small. sturdy stand, holds my phone safe and with reasonable price. Highly recommended. I got this stand for my sister, and she loves it! She needed something to stand his new phone when using watching videos. It's light and portable. Perfect for travel. Awesome! This phone stand perfectly fit for my phone, flexible and very functional. I bring it every where I go... Great price too! Great buy, fits in my minimal wallet perfectly. This little gadget is small lightweight and very transportable. It is also strong enough to hold up my smartphone on hands free viewing. Great for travel. This is small and sturdy. Made of plastic and metal, it really holds up to everyday use at work too! Happy with this product. Gorgeous phone stand. This is about the size of a credit card, light and very easy to set up. The design is ingenious. I love it! Perfect for travel! This is small, lightweight and strong. It hold my phone securely and I keep mine in my wallet to use where ever I go. Great phone stand! Its fits wonderfully into my wallet and holds up my phone just fine even in its case. Very handy and convient to use on hands free viewing:) Awesome! Awesome little cell stand! It serves the purpose well, very useful and functional. Perfect on my wallet. Highly recommended. A gem for the travelers like me. Takes up no more room than a credit card. Works great for my phone. Absolutely recommend this product! Overall great quality stand! Very sturdy and holds my phone well. Small, handy and very convenient to use anywhere I want. Perfect for my wallet or purse. Great price too! Cool little phone stand. I place my portable stand in my wallet. Very useful, the stand is always readily available and easy to configure. Awesome! Perfect for my viewing purposes. Fits in my minimal wallet perfectly. Great buy! Definitely recommend. Nice little utility! It works great, fits in my wallet. Very convenient and functional. Good price! I love how thin this is! I can comfortably put it in my wallet together with my other cards. Nice and durable. Great price too! Great and nice little utility! It's durable, sturdy, very light and fits nicely in my wallet. Functional and comfortable to use. I bought this for a trip to use on a plane. But I've found that I've incorporated it into my everyday, carry since it provides so much functionality at a bare minimum cost of space in my pockets. Fit nice and neat into my card slot in my wallet. Very convenient, nice, practical and very functional phone stand. Highly recommend. Works great and fits in my wallet. Great for on the desk or on the plane, I love this nice little utility, give one to your friend! My good companion:) I was very happy every time I had travel. This stand was made very well, very useful, small and handy. Perfect in my wallet together with my cards. Best deal! Well made quality. Small, tough and easy to use. Very handy I can keep this away in my wallet together with my credit card, ID and more. Functional and very comfortable to use. Very nice and practical! High quality, durable and it unfolds to be a pretty solid stand for my phone. Its most ingenious feature is the fold out lip which keeps my phone from sliding off. Great! I place my portable stand in my wallet. When I need a stand for my iPhone, the stand is always readily available and easy to configure. Thanks Geeks! It allows me to prop up my phone. Very functional, handy and great for my travel. Highly recommended. Very well and sturdy. I use it for holding my phone, it is easy to carry, and very functional and convenient to use. Perfect on my travels! Cool little kickstand for my phone. Very convenient to use and bring it anywhere since it was fits great for my wallet. Perfect for my travel, anytime, anywhere! Simple, easy and really effective. Great for on the desk or on the plane. It really solved my problem. I keep this tucked in my wallet along with my ID and Credit cards. Thanks Geeks! Excellent little phone stand! Very handy great for my wallet and very convenient to use. I would recommend this to anyone looking for a phone stand. Little gadget is a tiny bit smaller than my credit card. It unfolds to be a pretty solid stand, durable and very convenient to watch my favorite movies anywhere! Excellent performance, value, and quality of constructions. Awesome little phone stand. Exceeds my expectations. Sleek, solid and simple stand and had a great finish and perfect for my wallet. I'm ordering two more for my sister. Highly recommended. Pretty solid stand. Perfect for my phone. It most ingenious feature is the fold out lip which keeps my phone from sliding off, secure and safe. Great size a tiny bit smaller than a credit card. It works! This is simple, easy and really effective. Great for on the desk or on the plane, solved my problem. Perfect in my wallet! Small, functional and very convenient to use. Perfect on our camping and watching our favorite movies. Holds my phone, safe and securely, awesome! Holds my iPhone 6S perfectly and securely. It's very sturdy and looks nice. Very functional and great in every travel in my wallet. Great stand! Handy and functional! This is very portable, fits in my wallet with no additional bulk. I take it with me everyday, everywhere. Perfect! I love how thin it is! I can put it my wallet or pocket or just about anywhere I wanted. Nice and durable. I can still place it in kickstand without falling out. Great product for the price. Awesome little phone stand. Great value for the purpose. My great companion in every travel and I am very satisfied. Highly recommended. A simple, small and very useful phone stand. Perfectly fit in my wallet slot, very lightweight, and durable. Thanks for this little thing viewing my favorite movies without using my hand. Satisfied! Works like a Gem for my travels. It takes up no more room than a credit card in my wallet. Very useful and convenient to used. Great product, very stable and the metal seems very durable. Highly recommended. Finally a good and foldable phone stand. It holds my phone securely and great for every travel. Very useful and handy in my wallet. Awesome and such a versatile stand. A simple, small and great companion that performs wonderfully. Great for viewing my favorite videos. Small, very handy and super convenient to use. Extremely well designed and executed. Great companion on my travel journey. Happy for the price! Just the right side for my small table. Easy to use, viewing my favorite videos while on the stand. Perfect companion while travelling. It holds my phone comfortably and it look strong and sharp. A better viewing of videos and YouTube without using my hands. Perfect! Small, very handy, and very functional phone stand. Absolutely love it! Stylish and i can store it in my wallet. Great! I can used it when watching movies and videos. So small, simple but functional and very handy even in my wallet. Definitely buy more for my sister. I'm glad to have this little and pretty phone stand. Very convenient and functional. It adjust and i can store it in my wallet. Great price! Works great with my phone. Allows me to set conviently and viewing my favorite movies anywhere I want. This stand is simple, small, lightweight perfect for my wallet. A simple, fold able and elegant cell phone holder. It looks very convenient and functional fit great and clean into a card slot in my wallet. Great little stand! Stable and holds my phone easily. I keep it in my wallet, handy and convenient to use. Wonderful phone stand! I bought this stand as I ca carry anywhere. Very comfortable, i can put it inside my pocket or wallet case. Plus the ear buds:) Perfect! Excellent product. Holds my iPhone 6 plus with a case on it just fine. Looks great and very functional. Worth the price! Very convenient and functional phone stand. It works well, small, fit great and clean into a card slot in my wallet. Cool little phone stand. Small, tough and easy to use. Very functional and comfortable to use. I keep it tucked away in my pocket along with my ID and debit card. Amazing! Looks and feels great on my desk. Very practical, useful and very handy. I'm getting another one! I was surprised how convenience it is. Nice, handy and sturdy kickstand to hold my phone anywhere I go. The good thing is I can fold up to size of a credit card. Small, tough, and easy to use. I just keep this tucked away in my pocket along with my ID and debit card. Very useful and functional. Price was great too! Great product and reasonably priced! Small , very convenient and functional. It's works perfectly in my travel. Small and perfectly fit in my wallet. Sturdy, supreme quality and enough to hold my phone. It makes watching videos while eating a lot more convenient. I would definitely recommended. I have to say this foldable, portable was very beautiful. Small, sturdy and very useful to hold my phone. You deserve to have one. A simple and elegant cell phone holder. It's perfect for my desk and at my office! It gives me a stylish and practical place to have my phone handy. Thank you watching movies without using my hands. Phone stand was sturdy and I have no fear that it would ever fail to hold up my device or cause it any damage. It's stand firm without busting a sweat. Simple and well built. Great value! Small, solid and easy to use. Can hold my phone safe and securely. Best buy! Very happy with it! This little Phone stand was made very well, very useful and handy. Highly recommended. Best deal! Lightweight phone stand, sturdy and it serves its purpose perfectly. It will fit pretty much my smartphone vertically or horizontally. Amazing price! Perfect for my desk and night stand! This is a great value, solid construction, sturdy and very useful. I am very satisfied on my purchase. Very useful to hold my phone. This is simple, sturdy, attractive, flexible and functional. I bought a second one for my wife for Christmas. Awesome price! Works nicely for my iPhone 6 plus. It keeps my phone secure , protection and perfect for my desk for watching my favorite movies. Great gift for loved ones. Perfect for holding my smartphone. Very sturdy and holds at an angle where I can see emails/text/ calls coming in without stopping what i am doing and picking it up. It was very helpful. So very simple but it useful, I can use it when watching movies/videos with my kids. It's small but very strong stand and sturdy for keeping my phone in best viewing position. I would recommend this item and definitely buy more for my kids. best give away this christmas! I love this phone holder stand that I purchased. I keep one in my car, in my backpack and at my office. This allows me to prop up my iPhone 6 plus and watch a streaming movies without having to have a case with a built in kickstand. i will definitely buy more for my brother and sister as a give a way this Christmas! Great sturdy little stand! It's easy to carry even in purse. And the quality is amazing for the price. Pretty cool! stand works perfectly to my phone. Its adjust to more than enough angles, sturdy, small but with ample support. Great price, Smart buy. These work great and are easy to stash in a pocket or purse you can bring it anywhere! This little thing has been the perfect travel companion. It fits right into my wallet and I have no idea it's even there. I typically use it on airplanes or at work on my desk. There isn't much to say about it other than it just works. I've only used it with my Nexus 6P phone but I'm sure a tablet would work just as well. The support mechanism on the back seems sturdy enough for it. Love this holder I got it after researching similar items for days. I thought that since the price was so reasonable it would probably break sooner than later. It hasn't I use it to hold my phone while I cook wouldn't cook now without it. Best part is when I'm done I just fold it up and put it away. Doesn't take up any space at all. Really portable and fit card size to my wallet I can bring it everywhere for my phone in case it needs a stand! The stand works on the horizontal way, my phone was to heavy to stand up vertical . I like it a lot. It is easy, convenient, and lightweight. It is perect. Vertical or horizontal. Looking for this for months. Stand is simple, lightweight, and compact. Works perfectly for my caseless iPhone 6. This foldable stand is very useful and also very handy and portable. Now I can bring stand for my device without requiring a lot of space and weight to my bag. Indeed an awesome item ! I bought this cool phone stand as I can carry anywhere. I can put it inside my pocket, my wallet and even in my wallet case. Plus it is really good ear buds organizer sometimes. Every time I eat I always watched some movies on my cellphone and this one really works for me. As I need to just set up it and I can comfortably watch the movies I want anywhere. I like that it folds so nice and flat, no worries that my phones will fall. 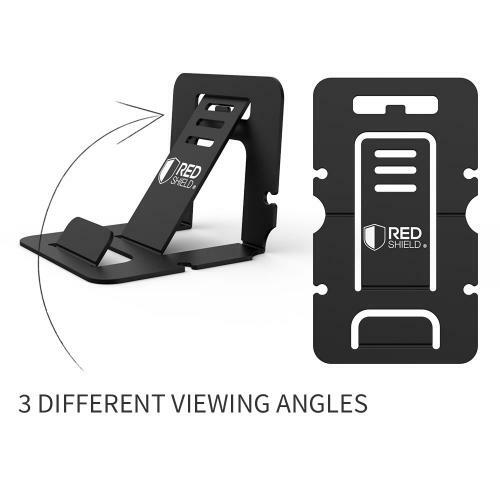 You're reviewing: RED SHIELD Universal & Portable Phone Stand. Flexible, Foldable Credit Card Size. Perfect for Viewing Movies & Videos on Your Smartphone in Landscape. Works as Earphone, Earbud Cord Wrap Organizer.